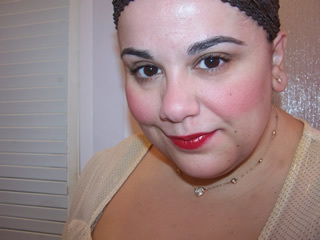 The Muse admits that it’s been a while since she purchased a ChapStick, since like…say…grade school! Eep! Recently I was watching Fringe….did you notice that Fringe is the awesome when it comes to commercials? I mean I barely have to fast forward through them as they are all of 60-90 seconds each…umm hello awesome! Anyway…I guess I wasn’t paying attention enough and I got blinded by Walter’s wit and before you know it up pops a commercial for ChapStick True Shimmer! 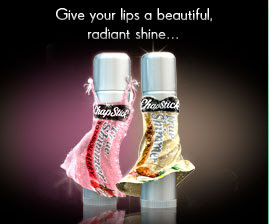 And suddenly it wasn’t Doctor Bishop’s wit that had me enthralled but the shimmery goodness of Chapstick True Shimmer! What’s this? 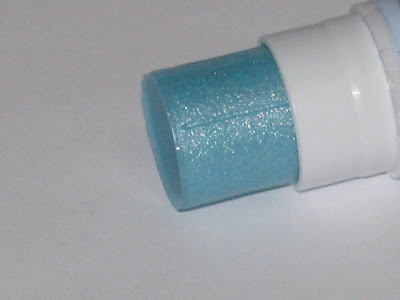 A ChapStick with shimmer? The Muse must haves it now! Sadly, after watching the ChapStick tubes get jiggy with it on the commercial in sparkling pinks and golds, I was unable to locate either. Turns out the pink is a berry flavor and the gold is a tropical flavor and of course neither was in Walgreens while I wandered around for the better part of half an hour marveling over the fact I was actually in a drugstore that was on US soil! Bless be! 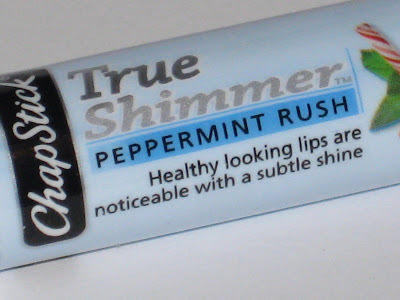 However, the good news is I did find ChapStick True Shimmer in Peppermint Rush which is pretty much better than not having a sparkling ChapStick at all right? ChapStick vamped up and getting jiggy with it! Na na na na! Na na na na! 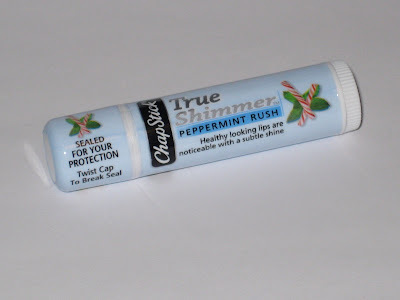 ChapStick True Shimmer is simply the same old, same old ChapStick from days of old with a touch of shimmer, scent, and the flavor of peppermint. Is it good? Yes, the Muse thinks so. 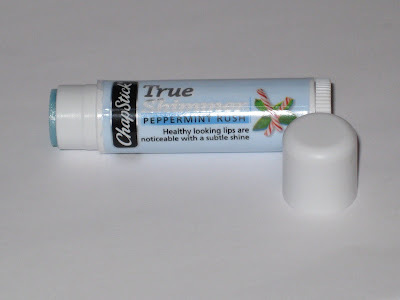 For under $2 USD (ranging from $1.50-$2.50 USD depending where you buy it) you can nab yourself a rather cute little tube of shimmering ChapStick to stash away in your purse for quick touch ups on the go. I love the novelty but I also think it’s completely conventional considering it protect lips from the harsh weather plus it has awesome shimmer. Seriously what more could a girl want? 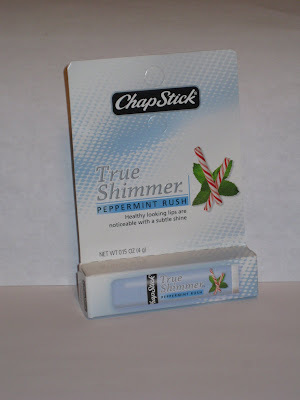 I was particularly thrilled with the silver shimmer of my Peppermint Rush ChapStick so I’ll keep trying to search out the berry and tropical flavors as they look more up to my speed! I can’t deny I like the idea of having a shimmering balm that’s inexpensive, protects my lips, and has a nice moisturizing finish with touches of sparkle so I’m Muse Approving it for purchase! 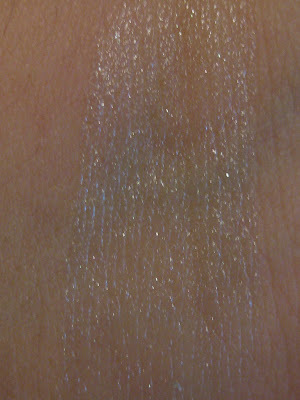 Inexpensive, shimmery, with a bit of a cute novelty too it? Yeah, the Muse likes it and she thinks you might too! Hmm, we don’t have them here yet. But do you think this could be a balm substitute of the blue gloss out in the market? but in the picture, the blue tinted look is tempting! thanks hun! Feeling rather special that I make mundane, exciting! I might have to try that out. Have you tried out the Nivea balms yet? They have phenomenal commercials but I do not like them. They have thicker tubes and the balm is thicker. I can feel it on my lips like a layer of wax–not like a flavor or Softlips (where it just feels slick). I got suckered into these by the ad in magazines like the one you showed-with the little twisty, sparkly dresses they’re wearing. I’m still trying to find softlips! I haven’t been looking very hard, it’s on my to-do this week. omg elizabeth me too! The damn chapsticks dancing around in the shimmery dresses caught me lol! Good luck finding softlips!!!!! 🙂 they are around just gotta dig ’em up hehe! Target carries them, if you have a Target store near you. I looked in target and they didn’t have them damnit! Ooooh, this looks great. My lips are crazy dry right now! I re-sent my email off my other account, so hopefully you’ll get it! It isn’t super important or anything though! And with Twilight, I just hit the ‘good’ part, when the bad vampires come to play. Parts of it are interesting, like the history of the vampires and stuff, but I guess the first part was just a little too dragged out for me, as well as the fact that seems very perfect, cooking and cleaning and being such a good kid. It’s an ok book, but I was just expected something AMAZING because of the huge hype around it. But maybe when I finish it I’ll be converted. My friend who lent it to my kept saying it was amazing. Lol. I picked up the berry one at CVS. I don’t like it compared to the regular chapsticks they are rather rough. 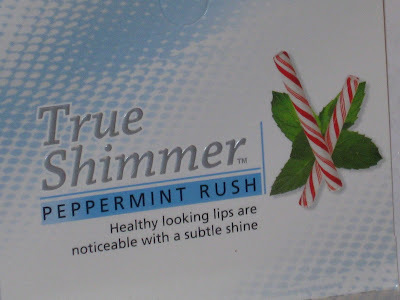 I haven’t seen peppermint rush yet, I’m a sucker for holiday products:] Glad you like them hopefully you’ll be able to find the others. me too me too! I hate the winter b/c I get such dry flaky lips yak! Keep with it you might adore it! I simply loved it in all honesty but I could be bias lol! So cheap, so good and so shimmery! Aawwhh…I saw your message to Vivian…I was hoping the blue color would show up. But I may get this anyway! Speaking of cheap lipgloss…I really like the Nivea cherry tinted lip balm (it’s amazing they are bringing more Nivea products here to the U.S.- they have tons of lipglosses overseas!). Also, I just received some holiday lipglosses from AVON- one is a peppermint with an actual pink/red tint; another is one that actually smells like its name: sugar cookie! Both for $0.69/ea. Nivea has such an extensive line in europe so sad it doesn’t reach us 🙂 the cherry sounds gorg!!!!! Ooh that looks nice! Now I’m curious as to what the pink shimmery one looks like!